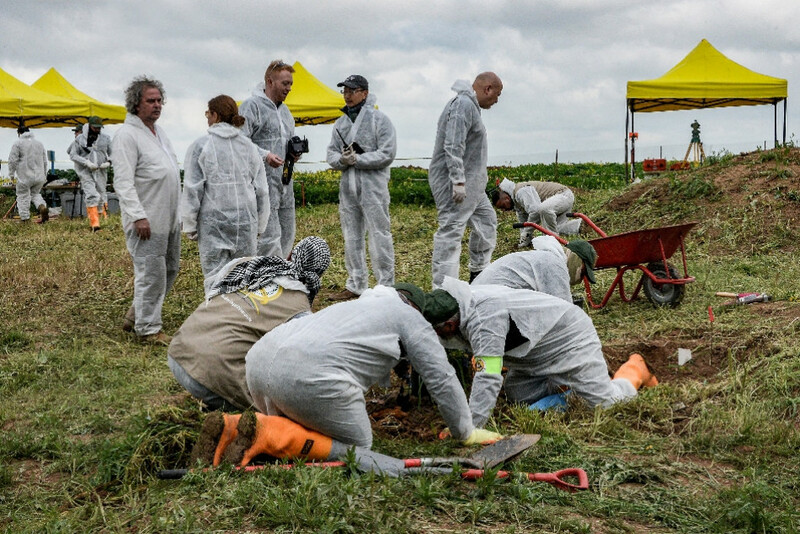 Forensic teams began the exhumation process of mass graves containing remains of Ezidi victims slaughtered by the Islamic State (IS) group in 2014 in the Ezidi populated town of Shingal (Sinjar) west of Mosul. The unearthing of the first mass grave in Kojo village started on Friday March 15, in a ceremony attended relatives of the victims, Nobel Peace Prize Laureate, Nadia Murad and Ezidi spiritual leader Baba Sheikh. KirkukNow correspondent in Kojo said a specialized team has uncovered the first mass grave in the village after families of missing victims criticized the slow-paced progress in the process and expressed fear that the remains of their loved ones could be washed away by heavy rainfall. In August 2014, IS militants targeted the the Ezidi religious minority in Shingal near the Syrian border. Thousands of men, women and children were slaughtered more than 6,000 Ezidis, mostly women and children, were enslaved and transported to IS prisons, military training camps, and the homes of fighters across eastern Syria and western Iraq, where they were raped, beaten and sold in slave markets. Ezidi women activist and 2018 Nobel Peace Prize winner Nadia Murad who is from Kojo and was herself captured and tortured by IS called upon Iraqi authorities and the Kurdistan Regional Government (KRG) to protects the mass graves so that the remains of the victims used as evidence of the genocide committed against her minority. The remains of the victims that will be exhumed from the mass graves are due to be sent to Baghdad for further genetic tests that would help identify the victims before they are reburied in Shingal. Karim Khan, head of the UN team overseeing the exhumation of the mass graves described the start of the process as “very important” indicating that 73 mass graves have been found in the Ezidi’s ancestral land of Shingal.